Last year, Justin Kurzel made his feature film directing debut with Snowtown, and I thought it was the greatest film of the year. Now along comes Wish You Were Here, also by a debut feature filmmaker – Kieran Darcy-Smith – and the challenge has, for me, been issued: let’s see another film this year top this one. The thing that marked Snowtown so much – or at least, that made it so astonishing – was its complete and utter assurance. Kurzel may have been making his debut, but he obviously knew exactly the story he wanted to tell and how he wanted to tell it. Likewise, Darcy-Smith is totally in control of his material (and brilliant material it is); he’s surrounded himself with excellent performers at the top of their games, an expert cinematographer, and, I can only presume, a crew of excellence, because the result is, essentially, perfect: there is not a moment in the whole thing that didn’t have me gripped. Four Australians have a holiday in Cambodia; three come back. That’s all I’m going to say about the plot, because this is a mystery thriller, and it relies on slow (and very deliberate) revelation. (This plot point – that only three come back – is revealed at the very beginning of the film, and I feel bad for the group who came in and sat down about eleven minutes late – they were in for a confusing time). Darcy-Smith wrote the deeply satisfying script with Felicity Price, who also takes one of the central roles in the film. It confidently embraces a fractured narrative that ranges across time and between two countries without ever being confusing or obfuscating. Indeed, it does the very opposite – it grips you like a vice. The last time I was this tense for a whole movie was… Snowtown. Although nothing like that film in terms of content or style, it has the same sense of dreadful tension; as a suspense thriller, it is an unqualified success. All the performances are top-notch. 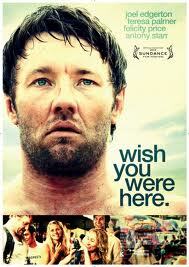 Joel Edgerton has the most difficult role and he is fantastic. The film rests heavily on his shoulders and he doesn’t put a foot wrong. His character, Dave, is extremely well written (well, the whole movie is) and Edgerton mines him for all he’s worth. It would make sense to acknowledge it as a “role of a lifetime” because it’s got everything a film actor could possibly want – needs, desires, wants, secrets, backstory, goals, obstructions, flaws, heroics, emotionalism. He’s going to win a lot of awards for his work here. Price, Teresa Palmer and New Zealand TV star Antony Starr all also deliver flawless performances. I’d never seen Starr before (actually I have, in The World’s Fastest Indian, but I didn’t know it then) and, on the basis of this, I have huge hopes for his success. In many ways he has the “simplest” part, but he makes a hell of an impression. Jules O’Loughlin’s cinematography (and camera operation) are sublime and filled with actual storytelling. He are Darcy-Smith use the camera ingeniously to reveal points of character, plot, motivation and suspense. O’Loughlin turns many scenes on their heads, as they are happening, by employing racks of focus and subtle dollies (echoing the “zoom out” effect) among other techniques; this is sophisticated work, arising from a deep understanding of each characters’ many levels, shades and contradictions. He also shoots Sydney and Cambodia in fresh ways, while always making the characters the absolute primal points of interest in each shot; there’s nothing in this movie that’s there “because it’s pretty”. (In one shot we glimpse one-third of the harbour bridge!) His excellent footage is edited masterfully by Jason Ballantine – who, I imagine, will also be picking up some awards, as this film is complex both structurally and emotionally, and he nails it. It is a measure of this film’s meticulous attention to detail that there are two minor characters – I’m not going to reveal them – that have no other credits on IMDB, because, I am sure, they’re actually from the professions their characters fulfill. Likewise, there are two government employee characters cast with street-level realism in mind, and one of Australia’s finest stage actors has been employed to play a small, silent role (which he does brilliantly). It’s that kind of considered, thoughtful, thorough film. When you look at the premise, there are two things that may concern you: being a mystery involving visitors to Cambodia, will the film provide satisfying resolution, and will it avoid racism? Yes on both counts. Wish You Were Here is deeply excellent on every level it chooses to operate. A brilliant review for a top-notch film…….definitely one not to miss. Great review, but I’ve got to disagree with you on one thing. I though Hiddleston was brilliant as Loki.